This talented Norwegian was one of my first transfers in Nottingham Forest. 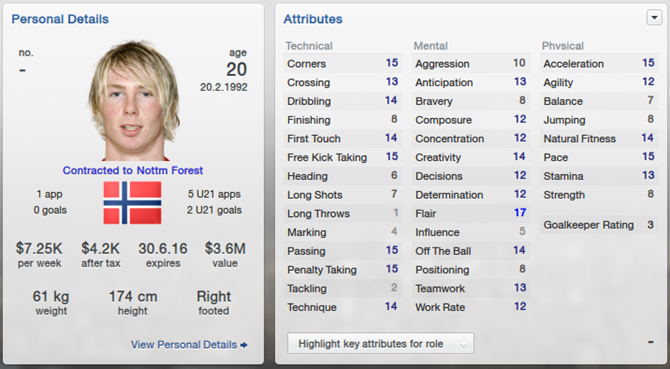 I bought him from Tromso for $1.5M only, and his price value is more than $20M. I want to talk with about Thomas Drage today, definitely one of the wonderkids in Football Manager 2013. If you rollback over my blog to the first season, you will see the same screenshot during the first winter transfer window. Drage was obviously my best signing during the first season. And now you can compare how his attribute changed in five years. Actually not that much. Though key attributes like Passing, First Touch, Creativity, Decisions, Determination, Flair increased by 2 points. It’s a decent result, good one. Nevertheless, I think it could have been higher if I had better coaches and training facilities. I arranged the training process of Thomas Drage using individual focus on Attacking Midfielder role with average intensity. One of key advantages the Norwegian possesses is versatility. Thomas Drage can play football very well using both feet. It’s significant he may play at any position in the midfield. Moreover, when I was missing a forward, Drage managed to show good performance at ST position with Advanced Forward role. I think Drage’s versatility compensates some lack of attribute levels needed for a player to become a world-class midfielder. Drage has been performing stably for Nottingham Forest since the very first season. Numerous goals and assists, average ratings around 7.30… Besides, he always had the high number of made key passes. Though I have to confess he declined a little bit during the last season, the most successful one. I link this fact with higher competition for places in a starting line-up. Let’s take a closer look into the last season’s stats. What’s your opinion of Thomas Drage? How has Drage been developing in your Football Manager 2013 story? The next post will be about Nottigham Forest transfers before the sixth season. I am almost done with the transfer campaign. There will be some surprizes of course :) By the way, I decided not to sell Thomas Drage despite large quantity of midfielders in the squad.